Just 100 metres from Sukhumvit Subway Station, Asok Montri Hostel is conveniently located in central Bangkok. 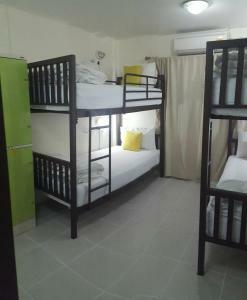 This non-smoking area features air-conditioned dormitory rooms and free Wi-Fi in public areas. Montri Asok Hostel is a 10-minute walk from the lively Nightlife Street in Soi Cowboy and a 10-minute drive from Pratunam’s shopping area. It is a 15-minute Skytrain ride from Siam Centre and Siam Paragon. Simply furnished, dormitory rooms are fitted with a work desk and have plenty of natural light. Shared bathroom facilities are available. For convenience, the hostel provides ticketing services. Laundry and ironing services are available upon request. Guests can relax in the common area, which has a TV and basic kitchenware. Please inform Asok Montri Hostel in advance of your expected arrival time. You can use the Special Requests box when booking, or contact the property directly with the contact details provided in your confirmation. Payment before arrival via bank transfer is required. The property will contact you after you book to provide instructions. Dormitory room for female guests features a work desk. Shared bathroom facilities are available. This room can accommodate up to 6 guests. Room rate is for 1 guest. Please note that this room type has no capacity to accommodate extra beds. Dormitory room features a work desk. Shared bathroom facilities are available. This room can accommodate up to 6 guests. Room rate is for 1 guest. Please note that this room type has no capacity to accommodate extra beds. Rate: THB 360.00 ... THB 950.00; select dates below to get current rates. Dormitory room features a work desk. Shared bathroom facilities are available. This room can accommodate up to 4 guests.